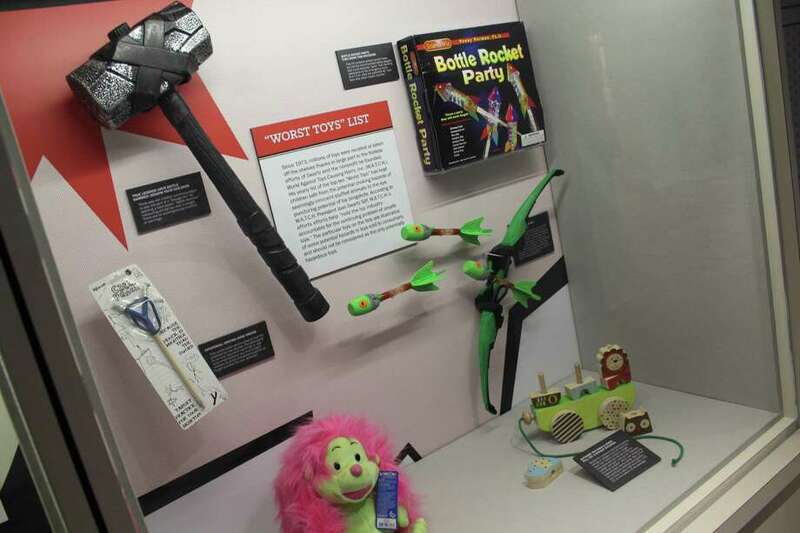 A display of some of the most dangerous toys in American history at the American Museum of Tort Law in Winsted, Connecticut. WINSTED — The American Museum of Tort Law stands grandly on the otherwise tranquil main street of Winsted, a town of about 7,000 people. With its classical courthouse facade, a turquoise banner announcing its name and a brightly colored, cartoon-like gavel depicted in downward momentum, it resembles more a “Ripley’s Believe It or Not” entrance or a set piece from “Better Call Saul” than a museum. And yet, not even Ripley’s would believe the amount of legal history — and the absurd amount of corporate malfeasance — documented within the museum’s walls. Tort law is when one party can take legal action against another as a result of an injury or injuries suffered. If one recalls the line, “if you or a loved one has suffered from...you may be entitled to compensation” line from television ads, that’s essentially it. And it’s an important line, according to the man currently at the helm of the museum. “This is about the law itself — about the cases, principles, rules and all the ways that tort law benefits everybody and also discloses wrongdoing,” Executive Director Richard Newman, a tall, white-haired, bespectacled man said as he guided me throughout the different parts of the museum. Adults $7, Seniors and Students $5. Children under 10 are free. Closed January, February and March, except for Tours. A former tort lawyer himself, Newman graduated from the University of Wisconsin School of Law in 1979, moved to Connecticut two years later and only retired from law in 2011. “When a case goes to trial it goes public and people can see bad conduct that has been hidden for years,” he added as he pointed out the famous cases like the flawed Ford Pinto car of the late 1970s and the Big Tobacco settlement of the mid-1990s. When I asked about what his most interesting case was, Newman teased me with a “can’t talk about it, that’s confidential.” While I may have found his reply somewhat ironic and waited for more information from him he never divulged, it was just another way Newman upholds his judicial and legal beliefs. The museum was founded in 2015 by the renowned attorney and former third-party presidential candidate Ralph Nader who, according to museum worker and former Nader presidential campaign volunteer Gail Weed, still visits the museum from time to time. At the entrance, visitors are greeted by the museum gift shop — a shrine of tort law books and shirts with comical political cartoons. An open visitor’s book shows signatures from Mexico City, Venezuela and even South Korea. It’s a quiet day at the museum this July 27. During the tour, I see only two other people, both silently reading the panels of the history section. Though the museum may not see the numbers say the Museum of Modern Art in New York City does, people who come with a prior interest in law leave with a newfound hop to their step. The museum does, in a way, have a certain pop culture flair to it — a touch that Newman admits renders legal history and cases, often in long-form and not too attractive, more appealing. Pulitzer-prize winner and Politico cartoonist Matt Wuerker drew the panels that hang in the historical precedents room and interactive screens guide readers through the stages of historic cases. Perhaps the tort law case most people recognize is that of the hot McDonald’s coffee where a 79-year-old suffered third-degree burns after spilling on her lap. Sure enough, the case is depicted on all four sides of a column with cartoons, important dates and numbers included — especially the temperature of the coffee back then, a scalding 109 degrees Fahrenheit. While tort law has given individuals and society different sort of collective victories, Newman believes that tort law is under attack from corporations and interests that want to see the impact of these cases diminished. Finishing our tour, Newman was eager to get back to work. And though he admits he doesn’t miss practicing law, he remains completely fascinated by the evergoing evolution of tort law and its countless cases. “A jury verdict can change the world,” Newman stated, confidently.